1. The Saints look like a "team of destiny." Much like how the depression in the auto industry was supposed to be saved by a Michigan State victory in the NCAA tournament last year, I find the whole Katrina angle that has been affixed to this game somewhat hollow. On the other hand, it's tough to deny how The Big Easy has rallied around the plucky Saints, and vice versa. A Super Bowl win would make for a nice fairy-tale ending to this season, even if it's not going to rebuild ruined houses and lives. 2. The coaching matchup appears to favor New Orleans. I didn't think much of Sean Payton's performance in the NFC title game, but his overall offensive genius has been proven over the course of his career. He'll definitely have a few wrinkles ready for the Colts D. On the opposite side of the field, Jim Caldwell remains something of a mystery. He's the best defensive player on either team, so his ankle injury negates a big advantage for the Colts. 4. The Saints have a surprisingly effective running game. New Orleans' trio of Pierre Thomas, Mike Bell and Reggie Bush combined to produce the sixth-best yards-per-game and yards-per-carry averages in the league. In big games like this one, being able to dominate on the ground can offer a huge edge. It was almost enough to make me think New Orleans had a shot to win. On Thursday, however, Donovan McNabb was on SportsCenter and made a point that crystallized the telling factor in this game: Of New Orleans' 35 sacks this year, 17 came off of blitzes. Saints defensive coordinator Gregg Williams faces a nasty proposition. By themselves, his front four can't generate pressure effectively. 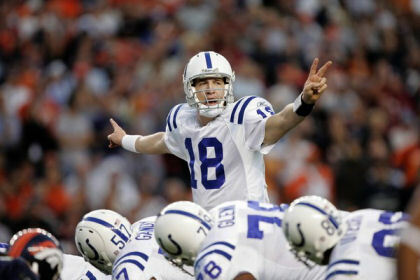 But, do you really want to blitz Peyton Manning all night long? Much has been made of Williams' comments regarding his intent to put the wood to Manning. Unfortunately for him, the Colts QB knows how to take sacks, move in the pocket to avoid pressure and throw the ball away. Best of luck roughing him up. The potential for a high-scoring shootout obviously is there. My guess, though, is that Indy chews up the clock in its typically efficient manner: bleeding the clock and exploiting holes created by blitzers in the passing game. The Colts will put up plenty of points, but the Saints? Not so much.